It seems that whenever we go on social media these days, dreamy images of bucket-list-worthy destinations flood our feeds. And for some, seeing those beautiful travel photos is nothing but motivating and inspiring. But for others, it can be downright depressing. If you’re that person — the kind of person who thinks traveling is too expensive and only for the wealthy — then we have some news for you. Take it from us, two recent college graduates who’ve already visited about 40 countries across four continents. With a bit of hard work, dedication, and some small lifestyle changes, you’ll be boarding a flight to your dream destination in no time! Here are 31 simple strategies we recommend to help you build up your travel fund. *This post contains affiliate links. In order to save up money to travel, you first need somewhere to keep your money safe! Look into opening up a high-yield savings account so that you can start piling up your extra cash and racking up your compound interest. If your current credit card doesn’t offer a great miles or cash-back program, then you’re missing out on a lot of potential savings to fund your travels. Once you’re approved for a new rewards credit card, forget about your other debit and credit cards, cash, and checks. Use your new card for all of your purchases. Remember, the more you use your card, the more miles you’ll earn! With my current credit card, I earn two miles for each dollar I spend. I also received 40,000 bonus miles when I spent $3,000 in the first 3 months of opening my account. Winning! Plus, using your credit card for every purchase also helps you to better track your spending! Even though interest and fees sometimes only amount to a few dollars, that’s still money that you could instead use for some street tacos in México, macarons in Paris, or a slice of pizza in New York City! Once you get your new rewards credit card, make sure to always pay off your bills in full, before your due date! When you’re trying to save up to travel, the worst thing you can do is waste your money on interest and late fees. A trick to make sure you always pay your bills in full and on time is to set up automatic payments! When life gets too busy to pay the bills, automation will have your back. If your day job’s salary isn’t going to cut it, consider freelancing or starting a side hustle. What special skills do you have to offer others? Think about how you can you make some extra cash, and do that! Consider starting your own travel blog (click here to join our FREE 7-day email course, How to Start a Successful Travel Blog), or doing freelance work like graphic design, writing, or photography. You can also start a side hustle such as babysitting, dog walking, driving for Lyft, making deliveries for Postmates, or teaching lessons of some sort. Instead of spending your hard-earned cash on expensive drinks at the bar, meals at trendy restaurants, and tickets to the movie theater, invite your friends over. Buy a bottle of wine at the grocery store, throw together a nice home-cooked meal, and watch a movie on your couch! Remember that you don’t have to go out and spend lots of money to have fun with your friends. For many, implementing this money-saving strategy is the hardest. But if you want to build up your travel fund, you must stop spending unnecessarily on restaurant meals and drinks. Challenge yourself not to spend money on food or drinks (other than groceries) for the next week. When you’ve accomplished that, extend your challenge to the next week, and the next week. See how long you can go without spending money on eating out. In other words, see how much you can save by not eating out. We know from experience that your savings from not eating out will be substantial. When it comes to building up your travel fund, meal prep is your best friend. Commit your Sunday evenings to meal prepping for the work week ahead, and you’ll save yourself a ton of time and money. With a little prep work, you’ll never go hungry again during the workday, forcing yourself to go out and spend money on lunch! To help you come up with meal prep ideas, check out our Staycation Eats section, as well as other food sites like Food52, Minimalist Baker, Munchies, Damn Delicious, and Pinch of Yum. Dates with bae don’t have to be expensive! In fact, there are thousands of exciting — and even romantic — things you can do that don’t cost a cent. Just to name a few, you can hit the beach, go hiking or biking, have a game night, go to a museum, watch a movie at home, have a picnic with food you already have in your fridge, or find a free concert. Buying trendy clothes that will go out of style soon is not a good use of your money. When you absolutely need to shop, stick to high-quality classics that’ll last you a long while — regardless of what’s on trend at the moment. But before you do go shopping for real, first go shopping in your own closet. You might be surprised at how many nice pieces you have, that you’ve completely forgotten about. If you can use what you already have, your travel fund will thank you! If you don’t already scour the internet for discount codes and sales on items you need to purchase, then it’s time to start! When you have to spend money, the least you can do is make sure you’re getting the best deal and not paying full price when you don’t have to! Right? Use sites and apps like LivingSocial, Google Shopping, Amazon App, and Groupon to search for the best prices on anything and everything you can buy online. Creating a budget is no use if you don’t actually commit to it! If you seriously want to travel this beautiful world, you first need to get serious about budgeting and saving. When creating your budget and savings plan, you’ll need to look at four different factors. Are there any expenses you can eliminate altogether? With those answers, create your budget and savings plan, stick to it, and reevaluate as necessary! To plan out your budget, it can be helpful to use an outside tool. Undoubtedly, one of the best ways to budget now is through technology, and my personal favorite tool is Mint. With this budgeting app, you can categorize your expenses, keep track of your income and expenses, and set spending maximums for yourself, among many other useful tools. Every time you grab a coffee or tea from your local cafe, that’s roughly $5 more you could’ve saved to travel. Honestly, would you rather spend $1,000 per year at cafes, or use that cash to hike the fjords of Norway, traverse the jungles of Brazil, or explore the Tuscan countryside? Instead, invest in a great coffee maker, Chemex, or electric kettle, so that you can quickly and cost-effectively make your caffeinated drink of choice whenever you want. Obviously, the more electricity and water you use, the higher your monthly utility bills will be. Whenever possible, cut back your use. Before you leave the room, switch off the light. While you’re brushing your teeth, turn off the sink. These little things might seem, well, little — but they really do add up! Not only is this strategy great for saving money to travel, but also it’s good for our environment. Win, win! Every time you get your paycheck, commit to stowing away a percentage of it in your travel fund — whether that’s as little as 2%, or as much as 50%. It’s all relative. 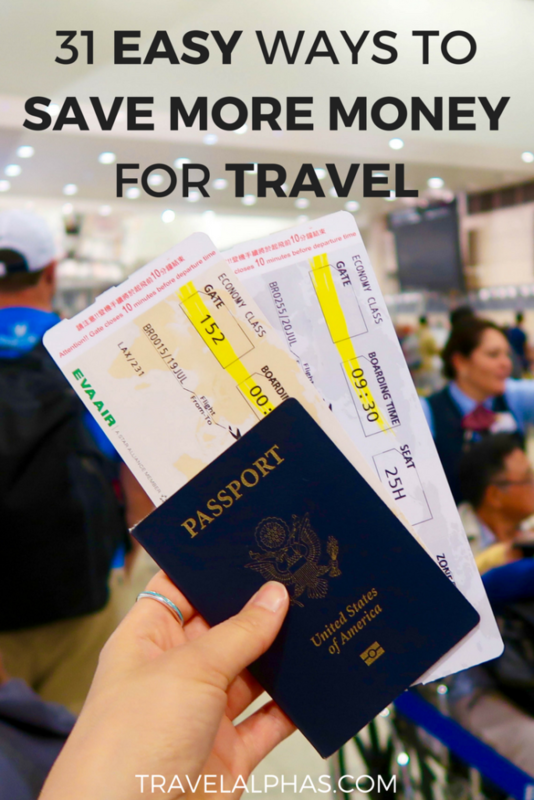 If you’re consciously making an effort to build up your travel fund, you’ll have enough to buy your plane ticket in no time! Everyone loves the little luxuries in life, and specifically the name brand items. But think of how much money you could save if you switched to generic brands! When it comes to things you can, and should, buy generic, the list is nearly endless: toilet paper, dish soap, laundry detergent, toothpaste, shampoo, pantry items, cleaning products, prescriptions, etc. While you may feel loyalty toward a certain brand, you’ll often find no difference between your usual brand name product and the generic product! The only real difference you’ll notice is all of that extra money in your travel fund! With having a car comes a car payment, gasoline bills, and an auto insurance premium. Do you really need all of that in your life? If the answer is no, ditch your car! Instead, ride your bike, walk, or take public transportation. And of course, if you can’t live without your car, you can always experiment with carpooling and/or driving less, to put some extra money back in your pocket. It’s time to cut the cable! Compared to streaming services, cable is expensive and lacks both ease and variety. Instead of paying for cable, you can sign up for a cheaper monthly subscription to something like Sling TV, Netflix, Hulu, or Amazon. Better yet, though, you can find some new favorite shows to watch on YouTube and stick to those — because after all, YouTube is free! By far, our favorite YouTube channel is Munchies. For the last few years we had our landline, the only people who called it were telemarketers. These days, everything is on your cell phone, so why waste a dime on a landline that you don’t need or use? Cancel that connection immediately and put that extra money directly into your travel fund! If you pay a dime to get your nails done, then you’re paying too much. If you can’t stand the thought of doing your nails yourself, then just think of how much money you throw at the nail salon every two weeks. Painting your nails yourself doesn’t seem so bad now, does it? Admit it. You have clothes, shoes, and bags in your closet that you haven’t picked up — let alone used — in years! Go through your closet (and your entire home) and sell everything you no longer need or want that has any value whatsoever. Use online platforms like Craigslist and eBay, or sell in-store with Buffalo Exchange, Crossroads, etc. After just one day of cleaning and selling, you’ll be surprised at how much money you just scraped up for your travel fund! If your stylist colors your hair, there’s a good chance you make an appointment every six to eight weeks. And there’s an even better chance that, every time you do, you pay somewhere between $100 to $300 for a cut and color! That’s a lot of cash. To help build up your travel fund, try getting your hair cut less and going all natural with your hair color. An easy way to cut back on costs is to stop buying water bottles, soft drinks, juices, and smoothies when you’re out and about. Having your own Hydro Flask that you can refill with water whenever you get thirsty is the way to go! Carrying around a refillable water bottle is cheaper, healthier, and better for the environment, so what’s not to love? And if water’s too boring for you, you can always kick it up a notch by throwing in some produce and herbs, like lemons, oranges, cucumbers, and mint! When you get fed up with the working all the time, it’s so tempting to just splurge on a quick (and usually expensive) weekend escape to a nearby city or beach town. But resist the urge! Remember that you’re saving up for something bigger and better, and if you do splurge, your dream trip will only get further and further away. If you need some adventure, pretend to be a tourist in your own town. Explore your parks, walk the streets, drive to the beach, visit the lake. Simply, take advantage of whatever is special in your own town, whether you usually take it for granted or not. Chances are, you pay monthly fees for services you really don’t need — or even use that often. Netflix? Amazon Prime? Apple Music? The gym? All of these memberships add up to a huge amount. While you’re saving up to travel, consider canceling all of your unnecessary subscriptions and memberships. Think of how much you could save if you worked out at home or outside, listened to the radio, watched YouTube videos for entertainment, and more. If you do decide to go out to eat or drink with friends, see if it’s possible to bring your own alcoholic drinks. For example, some restaurants will allow you to bring in a bottle of wine for a nominal corkage fee, which can be much cheaper than purchasing a bottle from the restaurant. Another alternative is to drink your wine, beer, cocktails, etc. before you go out! However, the best — and most extreme — lifestyle change here would be to stop drinking alcohol altogether. Just think of all the savings! In big cities, personal washers and dryers can be hard to come by, leading many urbanites to pay for laundry services. If you pay others to pick up your laundry and do it for you, you’re throwing away precious cash you could use to travel. Instead, go to the laundromat yourself and do your own dirty work. And if you don’t already have them, consider the one-time costs of purchasing your own iron and ironing board. If you’re really serious about saving money to travel the world, cancel your cell phone service plan altogether. If you decided to solely use wifi to communicate, surf, and share with your smart phone, you could save at least $50 — but maybe even up to $150 — per month, depending on your current plan. That’s a lot of potential savings, people! Download Acorns, a micro-investing app which allows you to invest the spare change from your purchases. For example, if you spend $5.30 on a smoothie, automatically, the spare $0.70 from your purchase will go into stocks, helping you save, and also earn, money! Whenever you feel like unnecessarily spending, think of what else you could use that money for abroad! Picture yourself on vacation and remind yourself how far that same amount of money could get you in Bali or Thailand, for example. You could even change your phone and laptop screensavers to a photo of your dream destination, as a continual reminder of your goal to build up your travel fund. Lastly, and most importantly, prioritize traveling. If you don’t believe traveling is important, and if you’re not committed to it, then it might never happen for you. Whenever you’re faced with a tough decision, prioritize the thing that’s most important to you. If you decide that thing is traveling, then you will make it happen. You will build up your travel fund and just go! SAVE THIS POST ON PINTEREST FOR LATER! What are your best tips for saving money to travel the world? Do you have any others ideas on how to build up your travel fund? *This post contains affiliate links. See our disclosure for more information.